I buy most of my DVDs and Blu-rays from Amazon. Mainly Amazon UK, but also US and DE. 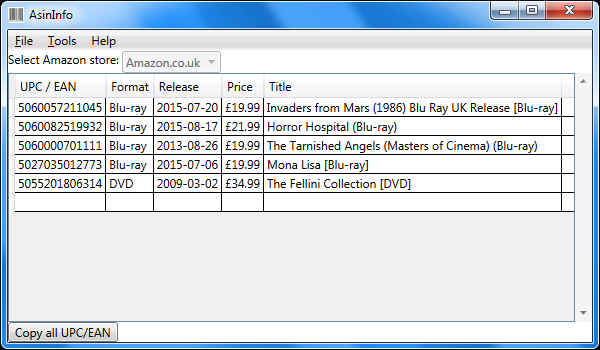 I always found it a bit cumbersome to add titles from Amazon, since they don't show the EAN / UPC on their product pages. I have been using DJ Doena's excellent AsinToEanConverter, but even though it helped a lot, I still wasn't quite satisfied. I wanted to write my own program, but getting data from Amazon isn't a walk in the park. Then DJ Doena offered me to use a DLL that he created for his program. I am most grateful to him for that. Without it, this program would not have been made. So the idea is that you drag or copy URLs (or copy just the ASIN) to AsinInfo and it fetches the info from Amazon. The with a click of a button you copy a list of the EANs / UPCs to the clipboard, which you then can paste into Profiler. More info and a download link here. Well, there's a little story behind this program, in case anyone is interested. Initially I found that DJ Doena had written a small console program that ran the ASIN to EAN conversion in a batch with the ASINs in an input file, and creating a couple of output files with EANs and UPCs. And I wrote a small front end program that ran his program in the background and just read the output files. You know (or you probably don't know, unless you're a programmer), it's when you start thinking "Wait a minute, this opens up new possibilities." So I realized that there was no longer any need to do the conversion in a batch. I could do it as soon as I got the ASIN. And I could pick up other bits of data besides just the EAN or UPC. So, instead of just modifying my old program I started writing a new one. And as I played with it, more things popped up. I tried keeping the program on top, so it would be easier to drag links to it. But I found that it sometimes got in my way. That's when I remembered some download manager that I had used way back that had a drop basket that drag links to. So I stole that idea and created a minute Target window. But then I found that I needed some kind of feedback when I dropped links onto the Target, so I could know that the title actually had been added. I could of course switch to the main window to check, but that would rather defeat the whole idea. So I made the Target change it's background color for a second to just signal that it went OK (or not). Probably the least useful feature is the ability to select default Amazon store. This is only of use if you add titles by copying ASIN, which is possibly the least convenient way to add a title. If you add by giving the program a URL, it figures out what store you're at automatically. But I thought, what the heck, maybe it's useful for someone. Sometimes I add bells and whistles just so that the program has some bells and whistles. Another programmer disease. Anyway, I hope that some of you find the program useful. Just thought I'd mention that you can actually drop any Amazon product into AsinInfo. I'm not sure why you'd want to, because it makes no sense in connection with DVD Profiler. But I've learned that people sometimes use programs for lots of other things than the developer intended. Ouch! I should have seen that coming. I often deal with this when adding less-common TV series to my "watched" collection which consists of movies and TV series that I do not own. The covers are small, usually do not have a back cover to reveal the UPC, and so I have to hunt the web for another site that lists it, and still I do not always find what I am looking for. I just updated 15 entries that have been sitting idle for I'm not sure how long. I've made a small modification to AsinInfo. If "Keep on top" is checked and you open the Target window, "Keep on top" will be unchecked. If the Target window is open and you select "Keep on top", the target window will be closed. In other words, both these windows will not be on top at the same time. So now you have the option of keeping the main window on top if you don't feel it takes up too much space. Otherwise you still have the Target window as before. I'm going to have to check this app out. I accidentally caused a little bug in 1.1.0. The Target window doesn't blink green (or red) when a shortcut is dropped on it. This is fixed in 1.1.1. I also added a little feature for my own use - an integration with GsyShipped. If anyone else is actually using GsyShipped too, you might want to get the latest version of that one as well. If you have both programs running at the same time, you'll see a button "Copy to GsyShipped" in the bottom right hand corner of AsinInfo. Click it and all titles will automagically appear in GsyShipped. - I now show number of dropped links in the target. Just so you don't have to switch to the main window to make sure you've got everything. - I added a check to make sure you don't add the same ASIN twice. Again for those who use the target. - When you selected "Close Target" from the target's context menu, the menu item "Show Target" in the main window was not unchecked. Fixed. No revolutionary changes, but since I fixed this for my own use I might as well share it.